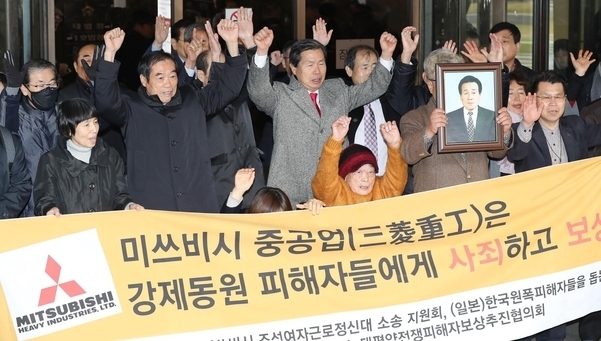 TOKYO -- Lawyers for South Korean victims of forced labor plan to request consultations with a Japanese firm over a set of issues related to compensation and the firm's apology, Japan's Kyodo News reported Saturday. It recognized the victims' individual rights to claim damages, though Tokyo claims that all reparation-related issues were settled under a government-to-government pact with Seoul in 1965 that normalized bilateral ties. The lawyers plan to make the request this month for talks with the Japanese firm and demand it make a response by the end of next month, according to Kyodo. Should the firm fail to respond sincerely, the lawyers would seek a legal process to seize its assets based on the court ruling. The forced labor issue has added to tensions in the Seoul-Tokyo relationship that has long been beset by historical and territorial feuds.